I've talked some over the past year about war related films, and that most war films seem to suggest a failure of logic in the concept of war. 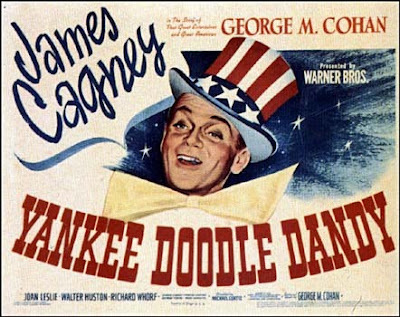 My wife and I watched Yankee Doodle Dandy, the 1942 film about the life of musician/actor/song-writer George M. Cohan who wrote a number of patriotic songs and musicals, including songs like "Grand Old Flag" and "Over There." It's interesting to watch this film almost 70 years after it was made, because I think America, critics, and the Academy Awards would have little tolerance for this film as a "modern film." 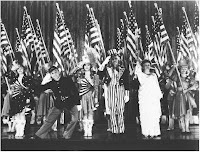 I think in a time vault of "that's how people thought in the early 40s" people respect the film today, but I think to be patriotic is viewed as less artistic, cheap, and unintelligent. And perhaps there was some of this in the 1940s too, and earlier. In the film, some people scoff at Cohen's "vulgar flag-waving" but the thing is that Cohen's plays are generally successful...he says something to the effect that he's a regular guy who makes plays for regular guys. I think there's something to that. I do, too. 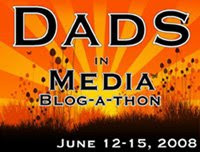 Being widely viewed (or read) can be something of a compliment to the work.